What is NonViolent Communication and why does it matter? 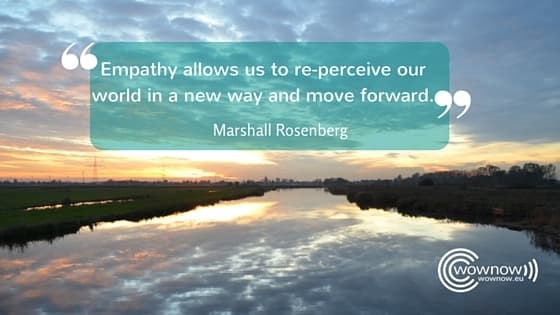 Who is Marshall Rosenberg, what is NonViolent Communication and why I believe this could strongly benefit not only every customer experience professional but anyone wanting to meaningfully and peacefully interact with someone else? In the past two years, I have followed several NVC training modules from Yoram Mosenzom (Basic, Intermediate & Advanced Training Modules and Mediation Module) and Cara Crisler (NVC applied to Motherhood and Connecting to Children). I have deep respect for this communication methodology and highly believe in its capability to empower and facilitate real connection to oneself and others. I especially believe that not only it can change the way we live with our family & friends, but also the way we interact with our colleagues and the way contact center professionals deliver customer service & technical support. Ultimately NVC is about empowering people to acknowledge, express and understand needs and about empathizing with each others needs, so that, instead of getting stuck on our preferred strategy, we can think of creative solutions to meet our respective needs, contributing to making life more wonderful for each other. This is very close to the vision of customer experience that I want to help companies achieve: a customer-needs-driven, happiness empowered growth, which makes the world a more beautiful and peaceful place for us to live in. Rosenberg died earlier this year. 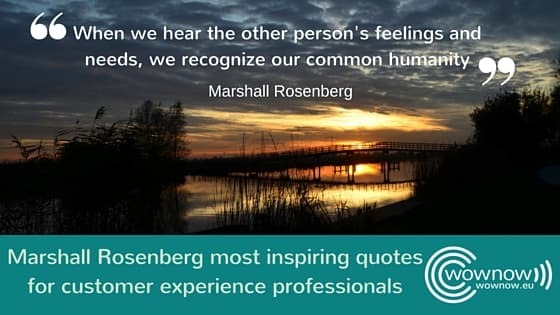 This post is a collection of some of the most inspiring quotes from Marshall Rosenberg, as a tribute to his work and as inspiration for customer experience professionals working from a place of focusing on customer needs, nurturing happiness and contributing to life. This post has been in our drafts for a few weeks already. But the Paris attacks of November 13th and months of powerless witnessing the Syrian refugee crisis, publishing felt like our only possible voice and contribution to world peace and humanity, because the more people will get familiar with NVC principles and way of communicating, the more hope for peaceful resolution of all conflicts andifferences. Ultimately, worrying about delivering exceptional customer experiences becomes trivial and unnecessary in a world where the basic needs of safety cannot be met, where people get attacked in the very same places (theatre, restaurants or stadium) where we strive to deliver remarkable experiences, where people live in fear. For this reason, we decided to add an extra paragraph “Addressing Terrorism”, with an extract from Marshall Rosenberg’s book “Speak Peace“, because, never more than today peace and safety return to being a necessary foundation for any customer experience, something which, at least in Europe, we had taken for granted since World War II. When we understand the needs that motivate our own and others behaviour, we have no enemies. In our culture, most of us have been trained to ignore our wants and to discount our needs. Four D’s of Disconnection: 1. Diagnosis (judgment, analysis, criticism, comparison); 2. Denial of Responsibility; 3. Demand; 4. ‘Deserve’ oriented language. Labeling and diagnosis is a catastrophic way to communicate. Telling other people what’s wrong with them greatly reduces, almost to zero, the probability that we’re going to get what we’re after. To practice NVC, it’s critical for me to be able to slow down, take my time, to come from an energy I choose, the one I believe that we were meant to come from, not the one I was programmed into. Empathy is presence. Pure presence to what is alive in a person at this moment, bringing nothing in from the past. The more we empathise with the other party, the safer we feel. It may be most difficult to empathise with those we are closest to. Empathising with someone’s ‘no’ protects us from taking it personally. Self-empathy in NVC means checking in with your feelings and needs. It’s harder to empathise with those who appear to possess more power, status, or resources. Empathy is like riding on a wave; it’s about getting in touch with a certain energy. But the energy is a divine energy that’s alive in every person, at every moment. Schooling teaches us to dehumanise human beings by thinking of what they are rather than what they need. We recognize that real educational reform is essential if today’s and tomorrow’s children are to live in a more peaceful, just, and sustainable world. What about you? 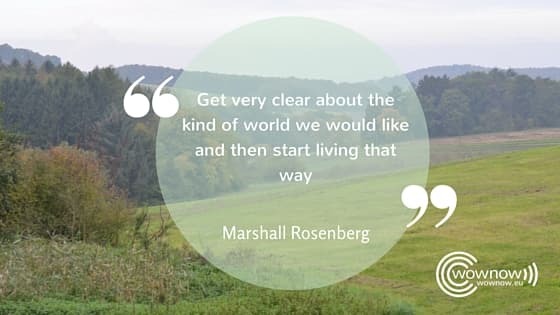 Were you already familiar with Rosenberg NVC? Can you imagine a word where everyone would be using this communication language?